June and All the fun of Summer! I thought the school year was busy?!? Boy was I wrong. Summer has felt infinitely busier. We got home from Casper and jumped right into activity after activity. 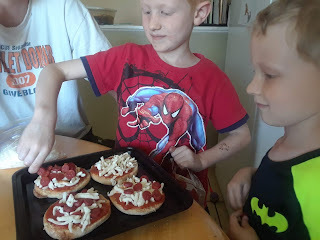 From making pizza to our annual trip to Lagoon with Dave's work, it's been all fun stuff but has really kept us busy! The kids were ecstatic that Dave took the whole Friday of Lagoon day off! We were there from open to around 9:30 at night! 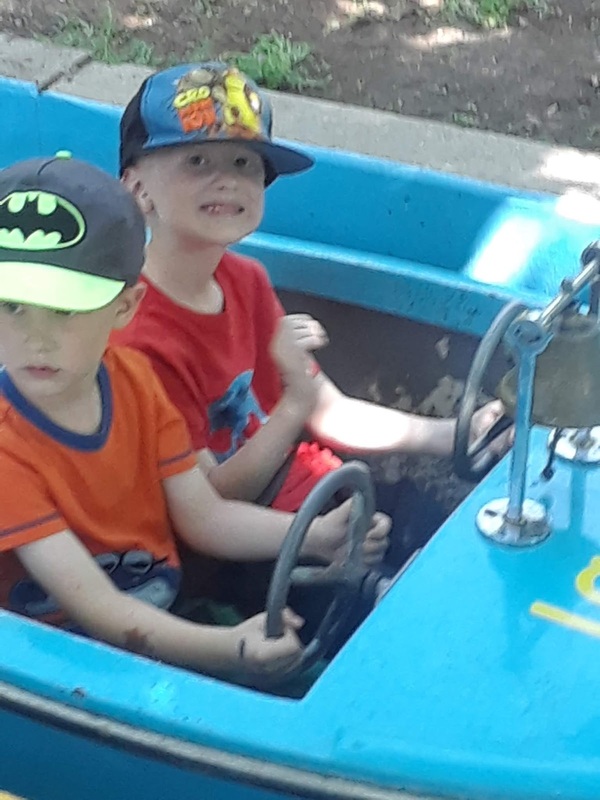 The kids look forward to Lagoon day all year and they had a blast riding the small rides with Brooklyn and the big rides with Dave. They took turns riding with each other and alone so nobody felt left out. Dave got to hop on some of the really big rides in the first hour while I took the kids around to the smaller rides to get us acclimated to riding again. Brooklyn did ride on of the big ones with me, and she loved every second of it! 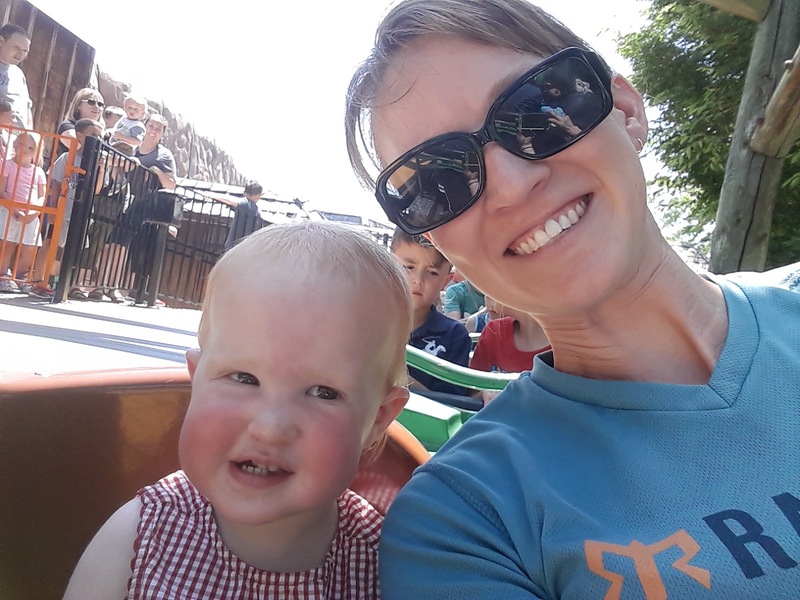 She cried when the boys left to ride a big one without her. She's such a brave little girl. We rode, visited Lagoona Beach, and ate at Dave's work BBQ. The kids each had 2 ice cream cones! They thought they were getting away with murder! By the end of the night we were all exhausted and ready to be home. Dustin has wanted his own fish for a while now and he was lucky enough to get some in the beginning of June! 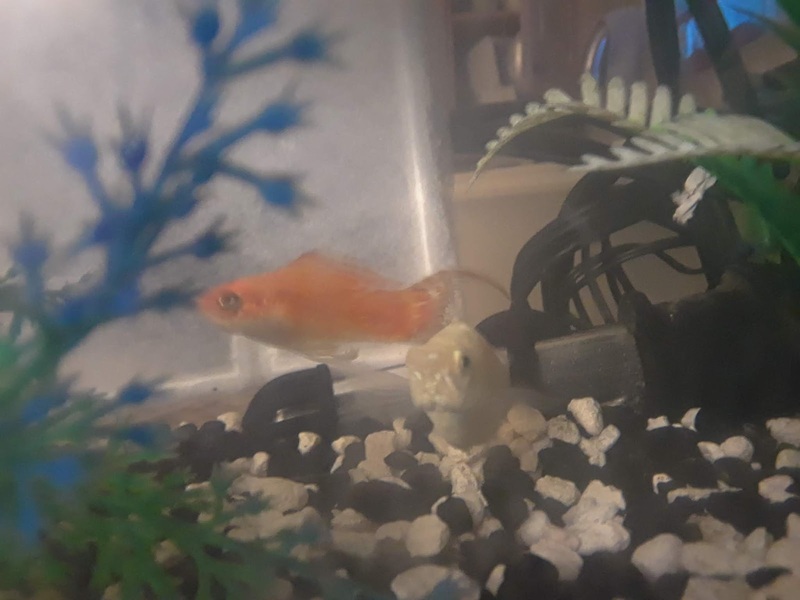 My friend Tenille found a free tank online for him and Rea and Sarah decided they were done with fish and let us adopt these two. Dustin named them Flash-ica and Snowy. They have acclimated to their new home and have started sharing a tank with 7th (Logan's beta fish). We put 7th into the big tank for a few play dates and determined he is too old to want to eat Flash and Snowy. So they all enjoy a big tank all together. I think 7th is around 5 years old. Since their average life span is 2 - 5 years we figure he is on his way out soon and just doesn't have the energy to chase the Mollies around and devour them. I'm just glad I don't have to keep up with 2 tanks. 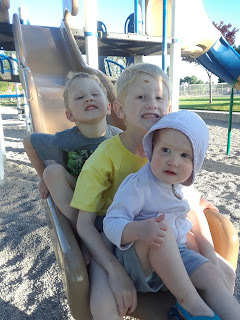 We've spent quite a few days at the parks near our house! 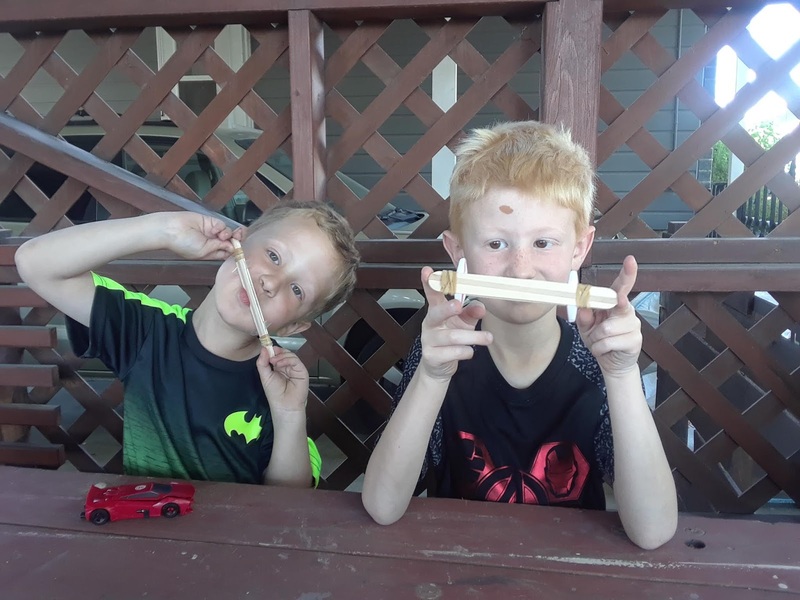 The kids love playing, especially with friends. We typically invite friends to play at the park with us twice a week. 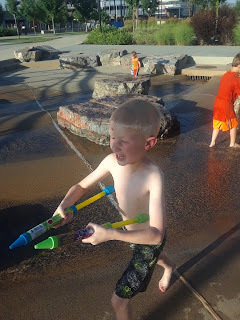 But it's been way too hot this week so next week we're switching to splash pads. What can I say? 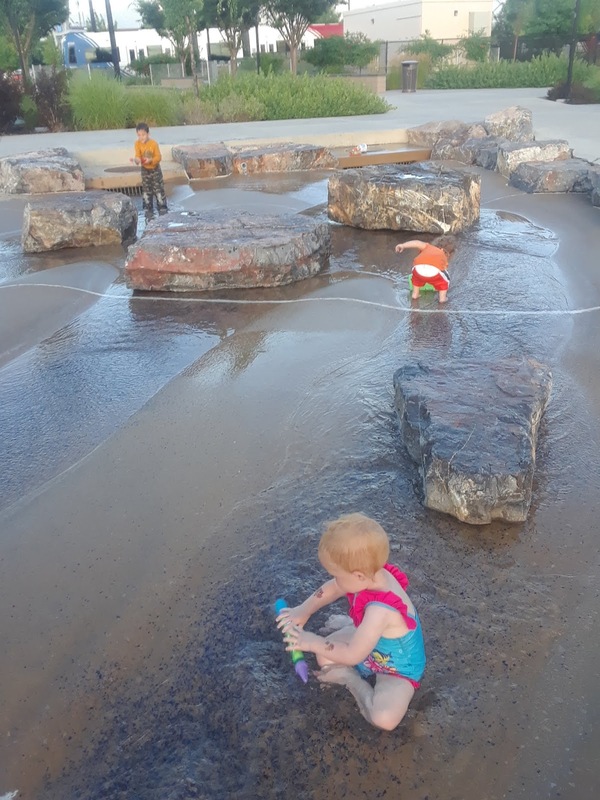 Our kids love playing in the water! They would play all day if I let them. The kids are doing the summer reading program though out Library and they get to count activities or creative building for part of the program. So we made homemade harmonicas. The boys thought it was awesome and whenever they re-find them they run around the house playing them! It's been fun. We went to This is the Place monument on free day. 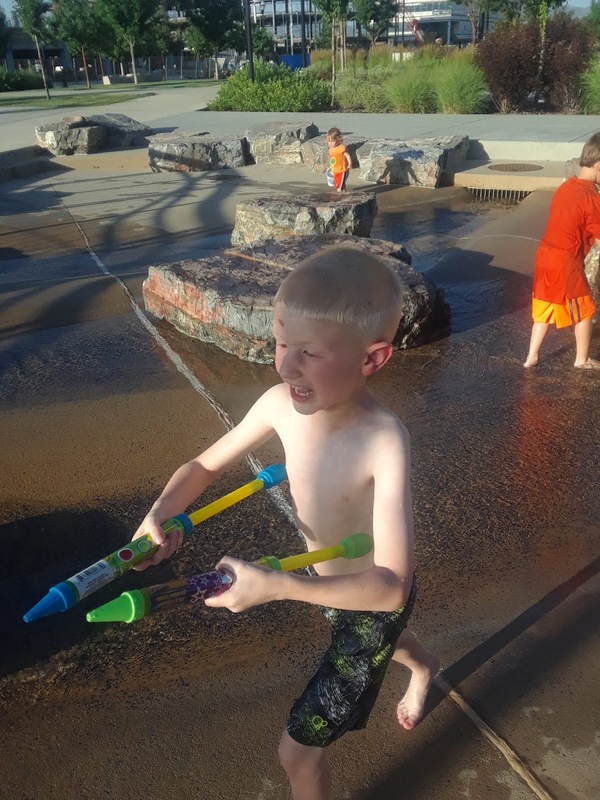 It was swelteringly hot, but the kids had a blast! We went to the petting zoo. Holy cow those animals were so mellow! Brooklyn was so excited she screeched at each animal! We pet the goats, pigs, and laid our heads down on the soft sheep. 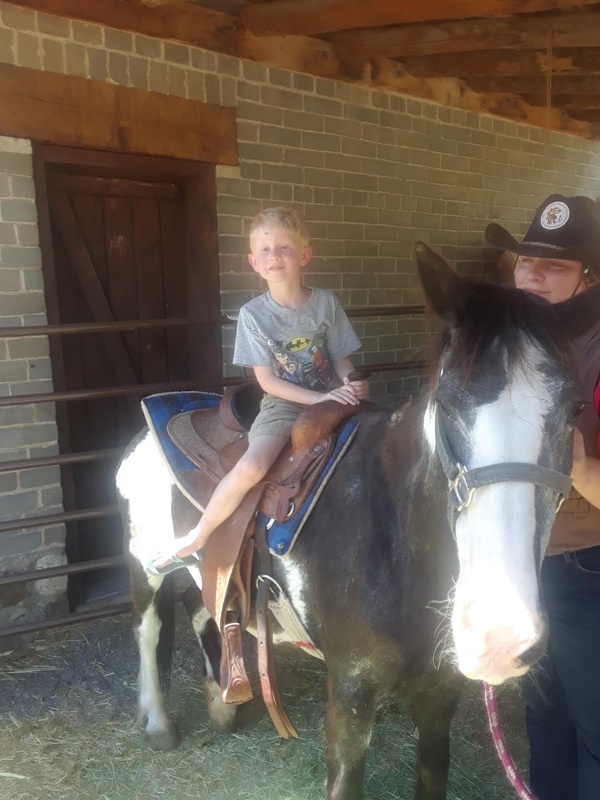 Brooklyn followed around the chickens and Dustin decided he desperately wanted to have a pony ride. So we waited in line for 1.5 hours so he could ride. He was in heaven!!! They let him go around in a circle 5 times. He named his horse Flash and we had 3 free ice creams throughout the visit. 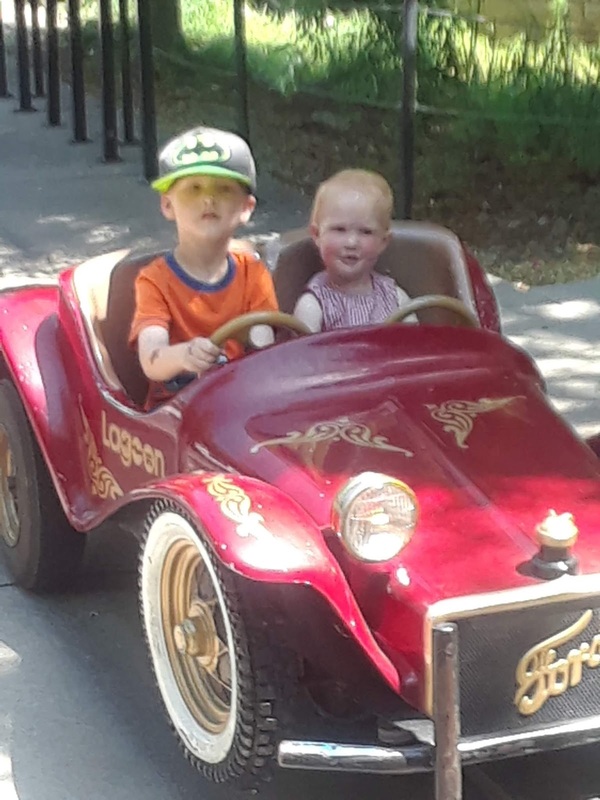 It was a hot but exciting day for the kids. 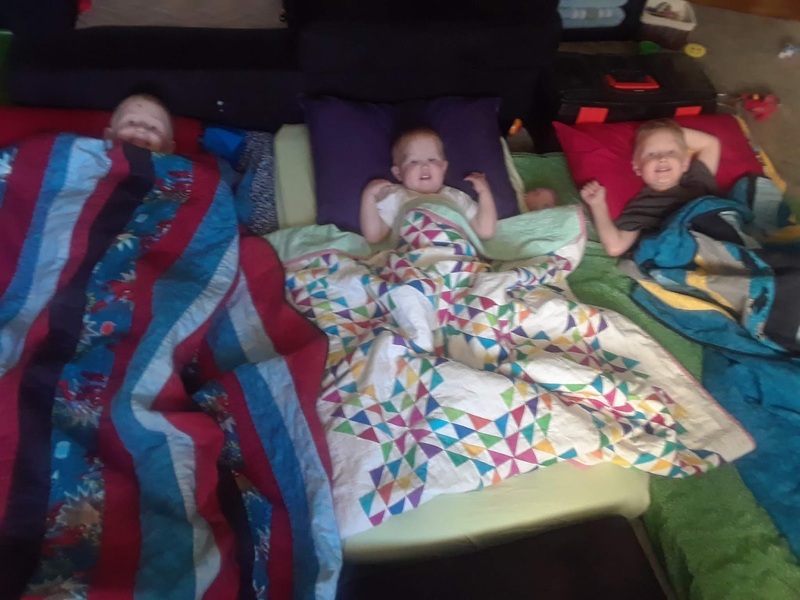 Brooklyn had her first sleepover with the boys this summer. They camped out in the living room with Dave and she slept all night on her mat (although I'm told she did kick Logan in the face at once point). They love having sleepovers so I'm sure it will happen again. 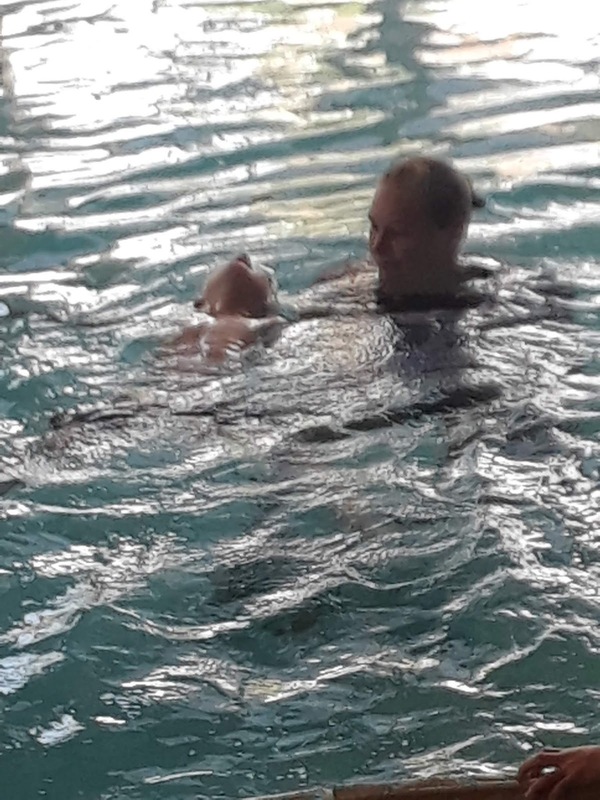 The boys have attended swimming class for the last 2 weeks. They had 8 classes total and learned a ton! This is Dustin's first year and he was terrified to go! I bribed him with candy, movies and a new lego guy. He clung to me when it was time for the first class and started crying but after getting in and trying it out he decided it was really fun! Dustin almost completed the second level class even though this was his first year! 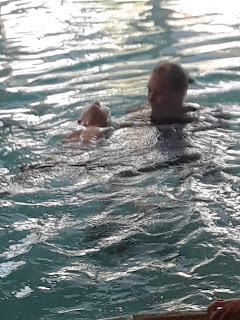 He can: get in and out of the pool without help, jump into water over his head, retrieve something from the bottom of the pool entirely submerged, Float on his back/front for at least 5 seconds unaided, do the freestyle and elementary backstroke. He looks like a drowning puppy when he swims, but he sure is determined and cute! 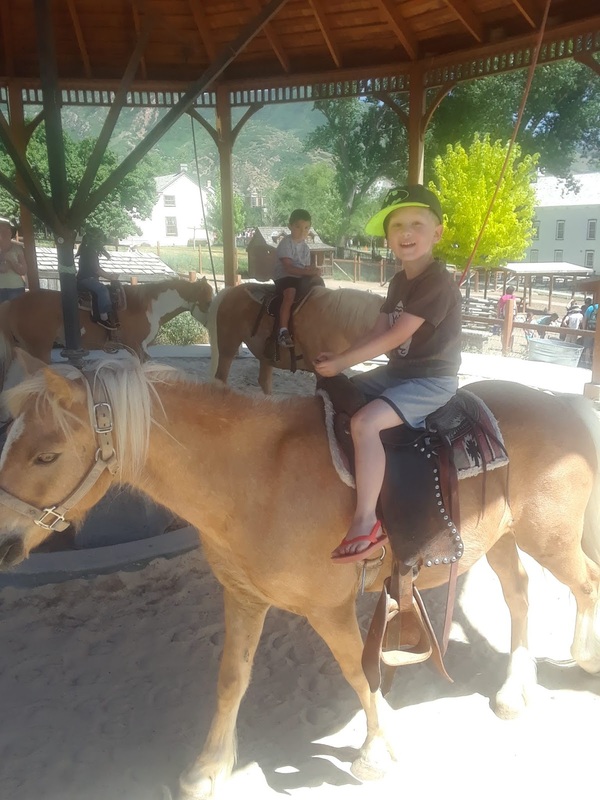 This is Logan's second year and he was in the level 3 class. He was excited to do classes again and is very sad classes are over. He really wants to do classes again next year. 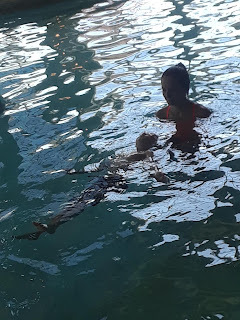 He can Glide on his front and back 2 body lengths, float on his front and back for 15 seconds each, swim 2 body lengths freestyle (with breathing), backstroke, or elementary backstroke. He is very confident in the water and swims like a fish! Swim class was devastating for Brooklyn!!! She hated that she couldn't get in the water with her brothers. They make parents sit poolside which means she had to sit and not get in the pool every class. I brought her tablet and let her play during class but it wasn't the same. I'm so glad the boys got to take the class but it was exhausting for me to get them ready and to class on time every day! I'm grateful to be done. I've been attending a Zumba class with my friend Chelsea Tuesday nights. It's been a nice break from the kids and good to get some exercise in. The teacher is awesome! It feels more like a Zumba/Hip Hop class to me. I've had to miss a few times but for the most part I've been going. I'm horrible at it but only know one person there so I'm ok with that. My friend Caitlin invited me to try out a Zumba class at a church a few miles away. I'm going to try next week, but it's at 8:30 in the morning and that's pretty early for the kids with it being summer. We'll see if the class is good and how it goes. Between that and working in the yard and little construction projects that's pretty much been our June! The boys are happy to have a new ceiling fan in their room that doesn't make noises when it's on high. Oh, Logan wants it to be known he also got a really cool Paw Patrol night light that is awesome. Dustin likes it too and we are happy we don't have to keep the hallway light on for them anymore. Buffalo, Elk and Bears, OH MY! We're off to a great start to the summer so far! The first week we mostly had a lot of fun playing, reading and enjoying not being in school. The second week of summer we went on our summer vacation! To start the trip off we met up with my parents in Yellowstone and enjoyed the park for 3 days. The boys loved exploring and hiking! They insisted on climbing every rock they came to. Even to the point that Dustin started climbing up a rock that was used as the boarder of a waterfall. Little stressful to imagine him falling to his death, but he lived. It was a wet year for Yellowstone, so the rivers were extremely high and the waterfalls were massively huge! They were so beautiful to see and impressive! We saw lots of animals on our trip! Buffalo, Elk, Bears! The kids were extremely impressed and Dave and I were excited too! Neither of us had seen a bear in the wild before, and we were lucky enough to see grizzly and black bears. We also got to have lunch with 3 elk. They were sitting in the middle of a field in the middle of town so we sat on a blanket close by and enjoyed watching them as we ate. They mostly laid around in the grass, but some times they would eat the grass and dandelions. 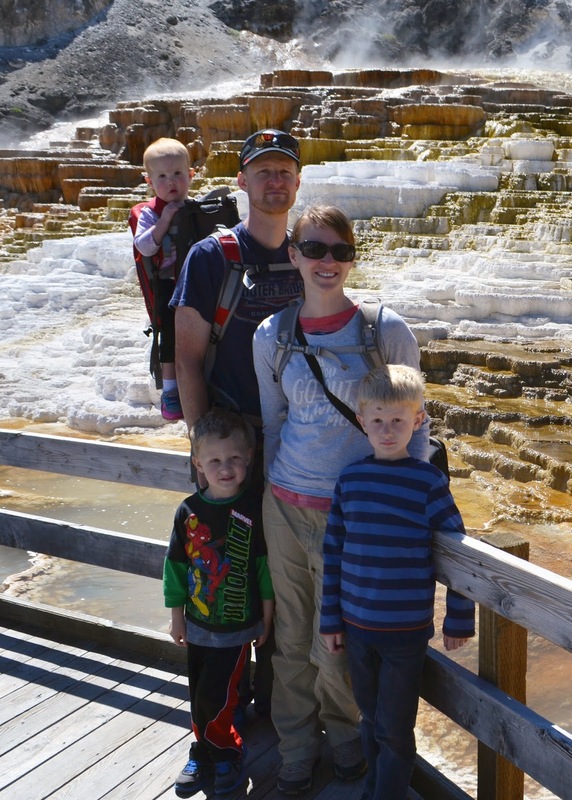 Yellowstone went a lot better this time than the last time we went (with just Logan). Last time Logan was scared of all the steam, but this time the boys loved the steam, all the colors and waterfalls! Dustin said this one was the funniest of all the things we saw because it looked like bubbling mud. As you can tell, he was really impressed. My favorite part of Yellowstone is always the Grand Prismatic. It's awesome to see the different colors. The boys favorite part of Yellowstone was hands down Chippy the chipmunk! Yup, they fed him all our trailmix. It totally made the hike worth it. The boys mostly did great hiking, but some times they needed help! Brooklyn was a little trooper too, although she mostly stayed in the baby backpack. After Yellowstone we headed to my parent's house for a few days of visiting and spoiling! We had a birthday party for me (woohoo! ), painted bird houses, visited the splash pad, a science museum, and did all kinds of fun things. We even got to see my brother Dan for one of our dinners. It was great to catch up with everyone and to just enjoy each other's company. Soon after arriving home we went to Dave's work Lagoon day. Since he took the whole day off, we got to spend the whole day at Lagoon. We were there from 11am to 9pm. I was absolutely exhausted when we got home, but the kids had a blast riding the rides over and over again. 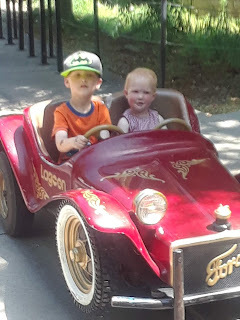 Since we were there so early they got to ride the big rides several times without lines. I took a picture of Brooklyn in this dress because it was my dress when I was a baby! I meant to look for a picture of me in it when I was at my parents house (I remember them having a picture of me with Grandpa Yoder at the DC Temple) but I forgot. But I thought it was appropriate to take a picture with the Irises that were in bloom since Grandma Yoder gave them to me. This week has gone by in a flash! 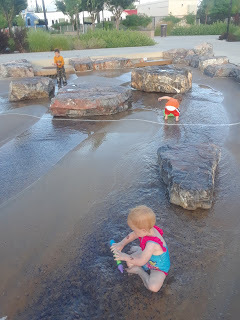 We have gone to the park twice this week, the splash pad twice, and done all kinds of picnics and fun activities. The kids won their first prize for getting along for the summer (I'm incentivizing them to get along). Hopefully they'll keep getting along. Dave has been working on converting our garden to a square foot garden. We're afraid by the time he's done it will be too late in the year to actually start a garden, but I'm good with begging tomatoes off the neighbors this year. It will be a nice setup to have for the future.